The Ocean Friendly Gardens program (OFG) sees landscapes and streets as solutions to water pollution – and more. OFG standards use this simple approach everywhere possible: contouring landscapes for rainwater retention; creating living soil to sponge up water, filter pollution and sequester carbon; and installing climate-appropriate plants to create wildlife habitat and a sense of place. At Bandon High School this installation is a cooperation between the Bandon Surfrider Youth Chapter and a class called the Go Native class. The chapter did the percolation rate testing, the design and installation labor. 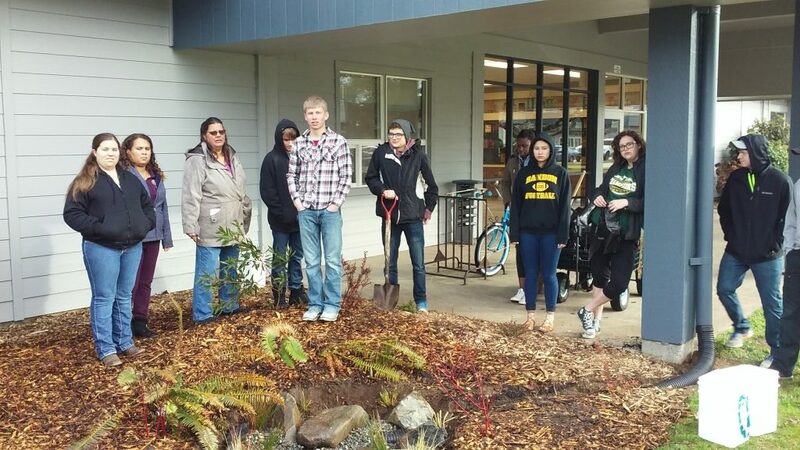 The class helped propagate the plants, removed the grass and did some planting. A big thank you to all the students and teachers involved in making this happen. The youth club is now working on creating an educational sign to accompany the garden, so stay tuned! Click here to learn more about Surfrider’s Ocean Friendly Garden Program.